In my line of work, helping people do philanthropy better, I am invited and asked to attend numerous fundraising events for all types of nonprofit organizations. On any given night of the week, or weekend for that matter, I could attend at least one if not two or three events. My guess is many readers can relate. Most of us know, we go to a fundraiser for a nonprofit organization attending the reception prior to the chicken dinner (it is almost always chicken) to listen to a few speeches and see a few awards given to some deserving individuals. This has been my usual experience until a night about a month ago in early October. My Michigan State University college roommate had recently taken on the role of Chief External Relations Officer at University Prep Schools located in downtownDetroit. She shared with me they were hosting their first fundraiser, at one of the Thompson School buildings, and asked if I could attend. Naturally, I said yes, I would be there. She was a bit anxious about the event, wanting it to be a success and I wanted to be there to be supportive of her and the organization. So imagine my surprise when upon arriving to the event, a bit early I might add, I saw people bringing in homemade cakes, pies and even a sweet bread for the event all packaged in various types of containers, boxes and pans with plenty of tinfoil and plastic wrap covering them. Immediately, I drew the conclusion that my friend was trying to save money and had asked folks to bring desserts for the event. But what I learned was far more clever and it astounded this long time fundraiser and devotee of philanthropic events. My college roommate, Margaret Trimer-Hartley, had enlisted the help of her friend,Nolan Finley, editor of the Detroit News, as well as Cynthia Ford to help make the event a success. 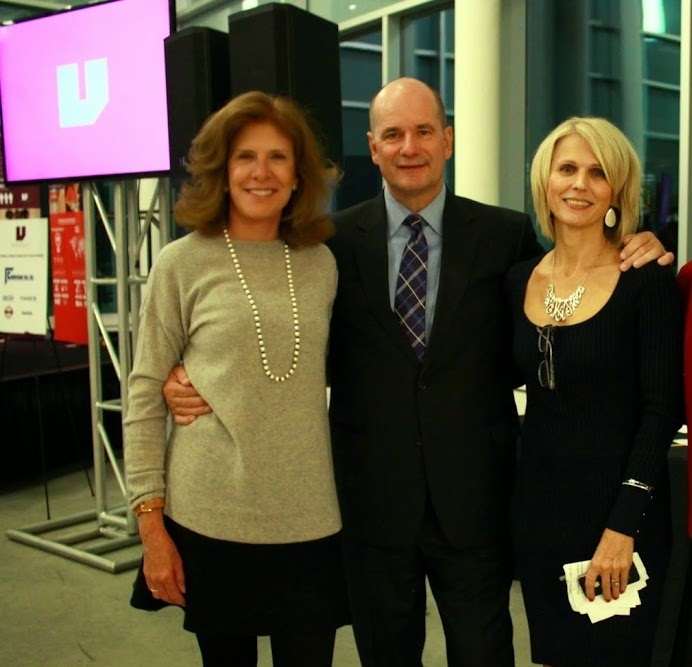 Nolan and Cindy are truly committed to the comeback of Detroit and eagerly jumped in to help and serve as co-chairs for this event. But the outcome of what happened next was amazing. During the planning process of how to raise money, Nolan made a suggestion based on his Southern upbringing and roots. He suggested an opportunity…sharing something he had witnessed in the South while growing up (he hails from Kentucky) but that had not been done anywhere in Detroit. A live auction of cakes and pies! 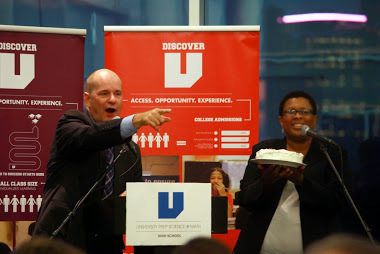 Now some might question how could an editor of a major newspaper in the North could think a Southern tradition of auctioning cakes and pies would work to raise significant dollars for a school located in inner city Detroit? It seemed like a ridiculous idea when I learned of it and even with a few silent auction items thrown in, it was an idea sure to fail or raise very little dollars. After all, many of us have witnessed bake sales at various elementary and junior high schools where only hundreds of dollars are raised. This school and organization was looking to raise thousands of dollars in a single evening with a live auction of baked goods, ticket sales and a few silent auction items. How could this succeed? But with Nolan, Cindy and Margaret leading the charge, it did succeed. First they asked “Movers and Shakers” in the Detroit area to become “Bakers” by donating something they baked for a good cause. And to everyone’s great delight, 12, including Nolan and Margaret said yes! They would be happy to bake for a cause an item that would be auctioned to raise money! To my great surprise and most everyone else in the room, the most inexpensive cake auctioned that night went for $175 — a Tres Leches Cake baked by my friend. The highest priced item “sold” was Nolan’s Peanut Butter Pie with a winning bid of $855.50. 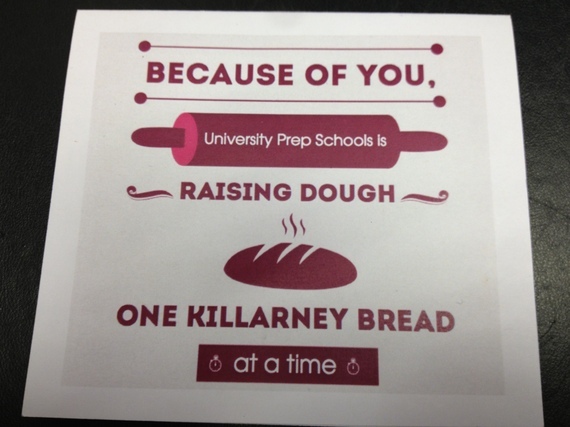 But the overall hit of the evening and most talked about item was the Killarney bread! Everyone wanted it and the two loaves were auctioned for $500 each! In total, the “Movers, Bakers and Shakers” Live Auction raised more than $6,000 and the cost to the organization was zero! And people are clamoring for it to happen again next year! And all were clamoring to be “bakers” for next year’s event. Because of you University Prep School is raising dough one Killarney Bread at a time. Nolan Finley definitely led an effort that was transformational, innovative and definitely made a difference! This story is shared to let readers know that there are so many ways to help your favorite cause, charity or nonprofit organization…and sometimes thinking out of the proverbial (cake or bread) box while brainstorming seemingly crazy ideas might just be the key to success. 1. Think creatively about trying new ways to raise money. 2. Don’t be automatically dismissive of seemingly offbeat ideas. 3. Do your part to raise funds! When you commit to helping a nonprofit organization raise money, follow through. 5. Set reasonable goals… you want to be successful. Most people are afraid of asking for money, or time or support from friends and family feeling like they are “begging” for help. Instead change your paradigm and way of thinking about it. When I ask people for money or to be supportive of a nonprofit organization, I always think that I am simply giving them the opportunity to change the world. Are you a wannabe mover, shaker or baker? Do you want to be? Remember, by doing any of the recommendations in this blog, you will definitely be on the path to offering people the chance to change the world and be M.A.D. (Making A Difference)! Are you M.A.D. today?